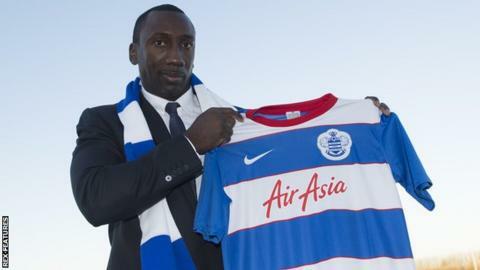 Championship club Queens Park Rangers have appointed Burton Albion boss Jimmy Floyd Hasselbaink as their new manager. The 43-year-old, who won League Two with the Brewers last season, has signed a rolling contract with the R's. Neil Warnock had been in interim charge of the west London club since head coach Chris Ramsey was sacked on 4 November. "It was not an easy decision to leave Burton but it was something I couldn't turn down," said the Dutchman. Hasselbaink joined Burton in November 2014 and leaves the club top of League One, having won 33 of his 54 games in charge at the Pirelli Stadium. He will be joined at Loftus Road by David Oldfield, who was his assistant at Burton. Rangers are 11th in the Championship table, two points outside the play-off places, and former Netherlands international Hasselbaink said the club has "an exciting feel about it". "I feel that this is a club on the up," he added. "I am happy to get the opportunity here at QPR, to lead the QPR family, be at the front of it all, put my stamp on things and take the club forward. "This is an incredibly proud moment for me and I will give my all to represent the badge of the club." The former Leeds and Chelsea striker was previously in charge at Belgian side Royal Antwerp before moving to Burton, and QPR director of football Les Ferdinand said they had been "hugely impressed" with Hasselbaink's achievements with the Brewers. "He is also a strong, authoritative leader who commands the respect of all those he works with," said Ferdinand. "He leaves no stone unturned in his work and prepares his teams meticulously. He is a young manager who has a great knowledge of the game. "We're all looking forward to an exciting new chapter at Loftus Road." Warnock, 67, and his assistant Kevin Blackwell have departed QPR following Hasselbaink's arrival, having guided the club to two wins in four matches since taking over.